Feel free to refer to this tutorial provided by Stone Gable. It was their blog that inspired me to create mine. 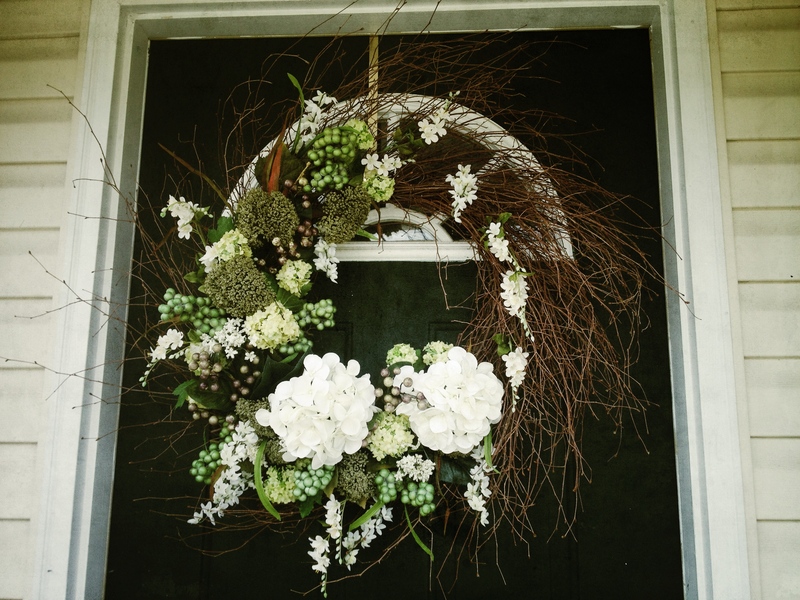 I FELL IN LOVE with this wreath and knew that the ONLY way to have my very own was to make it myself. I had a difficult time finding the same flowers as they did, and I also had to buy a similar wreath. Their wreath was full and lush! I bought a similar one at Hobby Lobby for about $14. I used a 40% off coupon as well. This wreath cost me a pretty penny. In hindsight, I should have paced myself and bought these stems with more coupons. It has only been within the past week that I’ve discovered that Michael’s, JoAnn, and Hobby Lobby all have iPhone apps that have exclusive coupons oftentimes NOT found in print or on their websites. It really does pay off to have the biggest arsenal at your disposal! StoneGable used green berries. I had no such luck at either Michael’s or Hobby Lobby. But I WAS able to find green grape bunches for $1.99 a bunch, and the darker berries were about $2.99 a piece. 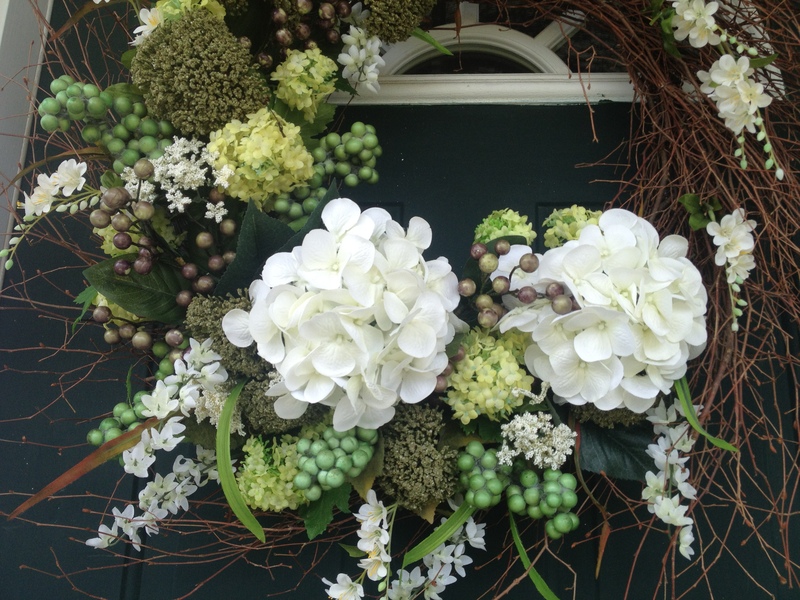 The costliest member of the wreath were the small, bright green bunches of hydrangeas. They run about $11 a stem (with only 5 bunches of hydrangeas on each stem!) so definitely use your coupons for those. I used green Queen Anne’s lace for the round green bunches. It was a nice filler that also provided wonderful texture and dimension. Here are pictures of my finished product. Again, I apologize for my lack of tutorial, but I will be more than happy to answer any questions you have! Thank you Sara Ann! Now that I look at the pictures, I think a few stems are missing :( We have lots of storms here in Georgia. Also, I will be making your blackberry cobbler for my father-in-law pretty soon. I can’t wait!